The Smallest Automatic Transfer Switches Available The full family of Cutler-Hammer Residential / Light Commercial Automatic Transfer Switches is for use on 120/240 volt systems; 30, 70, 100, 150, and 200 amperes; 2-pole. Standard Features  Proven, highly reliable microprocessor logic provides for completely automatic operation.  Monitors both normal and standby power sources.  Four separate time delays: Normal to emergency – 3 seconds. Engine start – 10 seconds. Emergency to normal – 10 seconds. Engine cool-off – 5 minutes.  High durability transfer mechanism uses industrial grade components to provide extended service life.  Plant exerciser with and without load. 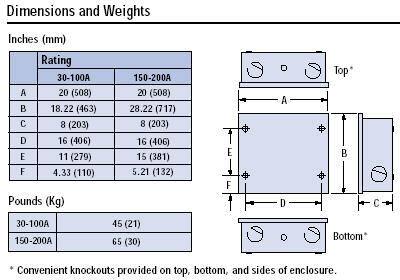  NEMA Type 1 enclosure, Type 3R optional. 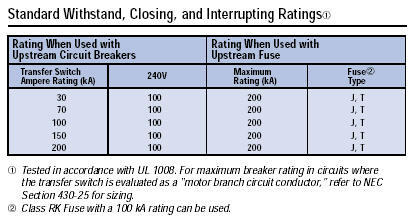  UL 1008 listed.  Conforms to applicable sections of the NEC Articles 517 and 700.  Quality Assurance Certificate, documenting tests and inspections, accompanies every automatic transfer switch.  Assembled in an ISO certified facility.